Traffic light signal boxes are found near traffic lights but unlike the latter, the former aren’t designed to attract the eye… unless they’re in Australia. If traffic light signal box art is your thing, then you might as well go for the gold. 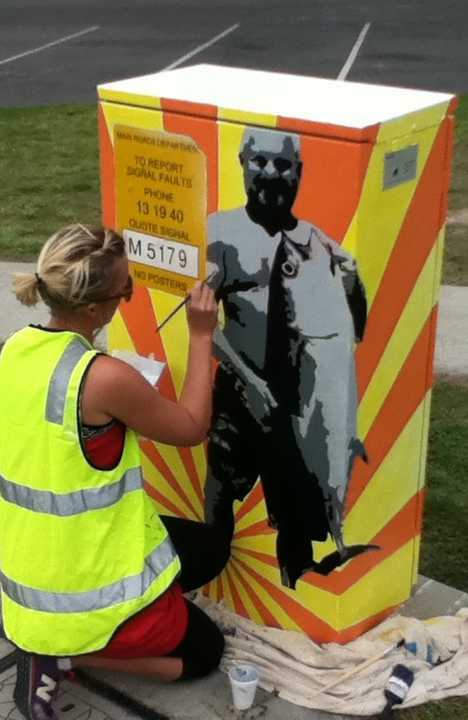 That means checking out this bright and sunshiny signal box appealingly upgraded by artist Sally Evans. 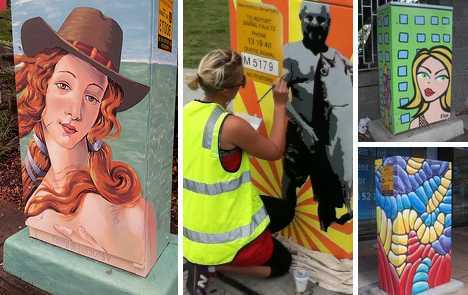 Located near the corner of Marine Parade and the Gold Coast Highway just south of Brisbane, this particular box was one of approximately 1,000 chosen by the local municipal council to be decorated by artists. Evans was inspired by local history: the box sits just outside what used to be the Holy Mackeral fish shop. Being blank, boxy and prominently located in unguarded urban settings, traffic light signal boxes are magnets for graffiti. What to do? Decorate the boxes before the taggers do! A study commissioned by Brisbane City Council projected that if graffiti removal wasn’t necessary, the potential savings would be in the range of several million dollars. 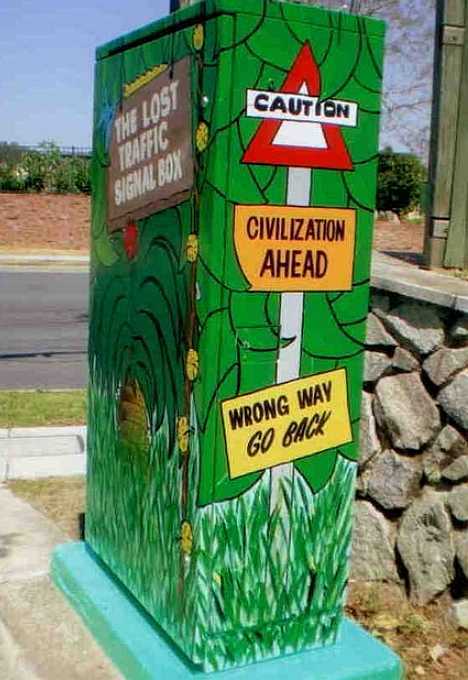 Artist John Ledingham is one of the most prolific traffic light signal box painters enlisted by Urban SmART Projects to spruce up urban infrastructure across the country. 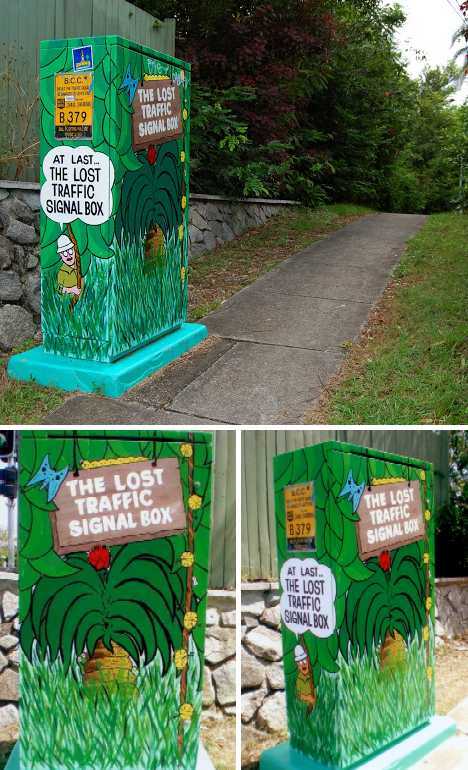 This one’s called “The Lost Traffic Signal Box” due to its partially obscured location just off Waterworks Road in The Gap, Queensland. No solution is perfect, however, and although the incidence of graffiti on Brisbane’s traffic light signal boxes has been significantly reduced, the scourge hasn’t been eradicated completely. 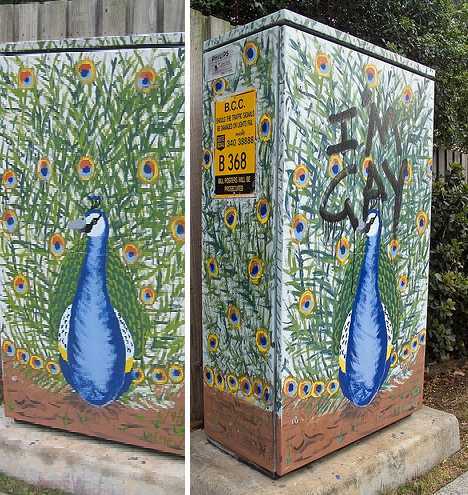 Flickr user Rae Allen documented one such defaced artwork: Erin Gregory’s untitled piece at the corner of Waterworks Road and Dorset Street in Ashgrove. Though Brisbane has more than enough traffic light signal boxes to go around, the process of applying to paint one can be complex. 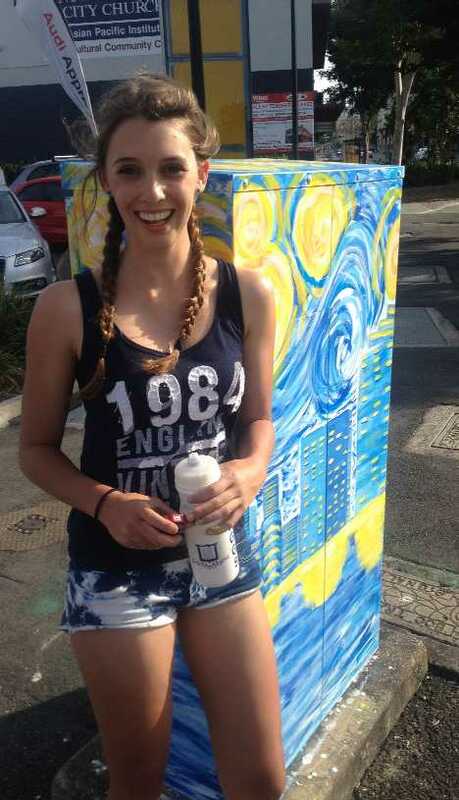 Brisbane teen Bella Reboul found that out when she applied to the city-run Art Force project for permission to paint a tribute to Vincent van Gogh’s 19th-century impressionist masterpiece Starry Night. Aspiring artists must first submit a design to Art Force. If approved, applications are added to a waiting list and in Bella’s case it was almost one full year before she was allocated a box. While artists are given a list of specific directions they must follow, at least all their materials and a safety vest are provided at no charge. 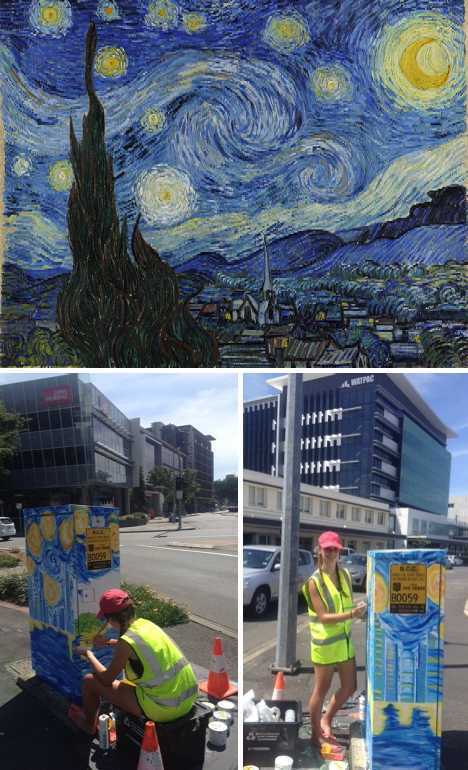 Bella’s Brisbane’s Starry Night tribute box now stands proudly at the corner of Commercial Road and Ann Street in Brisbane’s Fortitude Valley neighborhood.